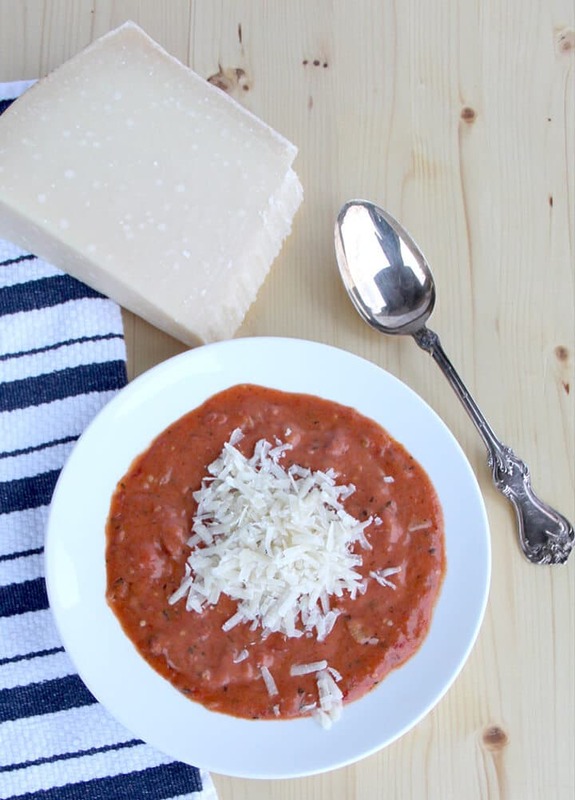 This Easy Tomato Soup Recipe is ready in under an hour! It’s made with canned tomatoes, dried herbs, fresh onion, and cream—just add a grilled cheese! Figuring out what to make for dinner can be a frustrating thing for a parent who’s just come in from a long day at work or dealing with kids. It’s convenient and easy to run by a fast food joint and grab some burgers…but it can be equally easy to throw together a healthy meal at home, like this homemade tomato soup. 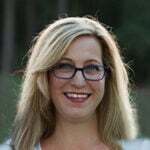 I wasn’t much of a cook when my boys were little and dinner usually consisted of frozen fish sticks, boxed macaroni and cheese and canned green beans. That’s all I had the time or money to do. But these days, I look toward meals with fresher ingredients that I can pull together in about an hour, retain some level of healthiness and still provide a tasty option, like homemade baked fish sticks, quick weeknight mashed potatoes, or skillet pork chops with vegetables. Yes! Although the canned version of tomato soup may be high in sodium and preservatives, when you switch to this easy tomato soup recipe you can control the amount of salt you add. We should all be eating more tomatoes because they’re packed with lycopene and lots of vitamins—so yes, tomato soup IS good for you! 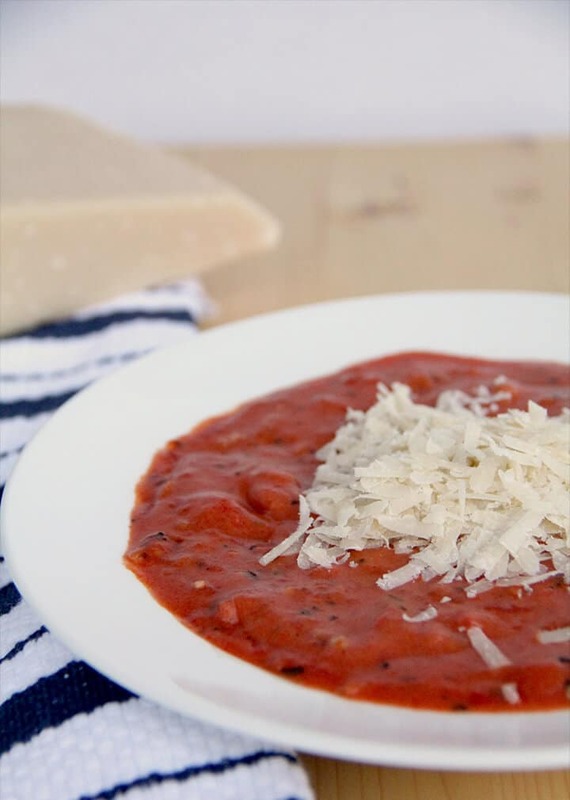 For this easy tomato soup recipe, you can omit the cream if you want to make it even healthier, and you can also omit the flour, although your soup will not thicken as well. You could also use vegetable stock instead of chicken and only olive oil for cooking the onions rather than my favorite combination of olive oil and butter. There are almost always simple ways you can make a recipe healthier while still maintaining good flavor and texture! One of our favorite easy weeknight meals is this homemade tomato soup. It’s super easy—the only things to chop are onion and garlic, and there are endless possibilities of additions. For this easy tomato soup recipe you need a large Dutch oven like this one and an immersion blender. If you don’t have an immersion blender, please get yourself one! It’s so handy for when you want to puree soups. No more scooping hot soup in and out of the regular blender! 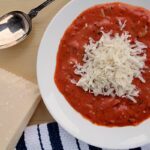 We keep this easy tomato soup recipe simple with ingredients you probably have in your pantry and refrigerator. It’s one of those meals you can make on the spur of the moment without having to run to the store! Heat butter and olive oil until butter is melted and hot and add onions. Cook for 5 minutes until starting to soften then stir in garlic and cook for about 30 seconds. Step 2. Thicken with flour. Stir in 1/2 cup of flour to help thicken the tomato soup. 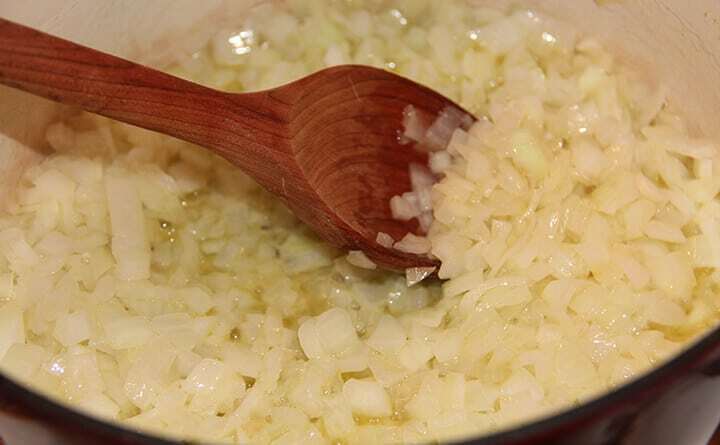 **Cook’s Tip: The onions will develop a thick, gummy consistency but just keep stirring for about 5 minutes, turning heat down if the mixture starts to burn or stick to the pot. Next, pour in 2 undrained 28 oz. cans of diced, fire-roasted tomatoes, 1 small can of tomato paste, and stir. Step 4. Add stock and seasonings. Stir in 3 cups of chicken stock. Add a little sugar, bay leaf, salt, pepper, thyme, and basil, along with about a 1/4 teaspoon of red pepper flakes. Stir the soup and bring to a boil then turn down to a good simmer. Simmer for about 45 minutes, stirring frequently. Stir in 1/2 cup to 1 cup of heavy cream and simmer for a few more minutes to blend the flavors. **Cook’s Tip: Start with 1/2 cup of cream and see if that’s enough for you. That’s all I usually add but some people like it even more creamy. We love this Easy Tomato Soup with a simple grilled cheese sandwich but of course you could get fancy and make this Cajun Grilled Cheese or Homemade Croutons. 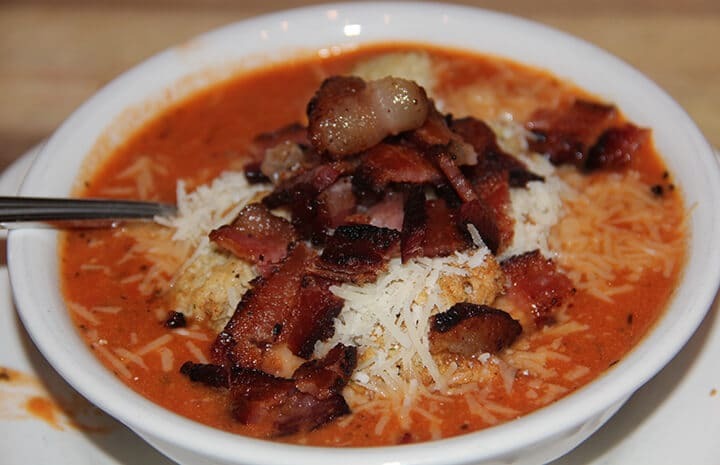 And you can top your tomato soup with crispy bacon and Parmesan cheese! Yes! I like to use these deli-style containers that I order from Amazon. 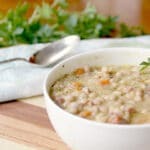 They come 24 to a pack and are inexpensive and perfect for storing and freezing soups. I use them all the time if I need to transport something to a friend’s house too because if they get left behind then you don’t feel like you’ve lost expensive storage containers! To freeze the tomato soup, just allow to cool and place in a freezer-safe container in the freezer for up to three months. Thaw in the refrigerator and heat and serve. Perfect for one of those evenings when you’re too busy to cook! Use a non-reactive pan so the acid from the tomatoes doesn’t cause a metallic taste. Non-reactive pans would include stainless steel or enameled cast iron which is my favorite. Stay away from aluminum or copper for this recipe. If it’s summer and you have access to good fresh tomatoes, you can certainly substitute for the canned. You might need to add a little tomato juice as well. Fresh herbs will work in this recipe, although I would probably still add a little of the dried as well. When adding the red pepper flakes and the cream, start with the smallest amounts and taste, adding more if needed. If you’ve tried this Easy Potato Soup, please rate the recipe and leave me a comment below! 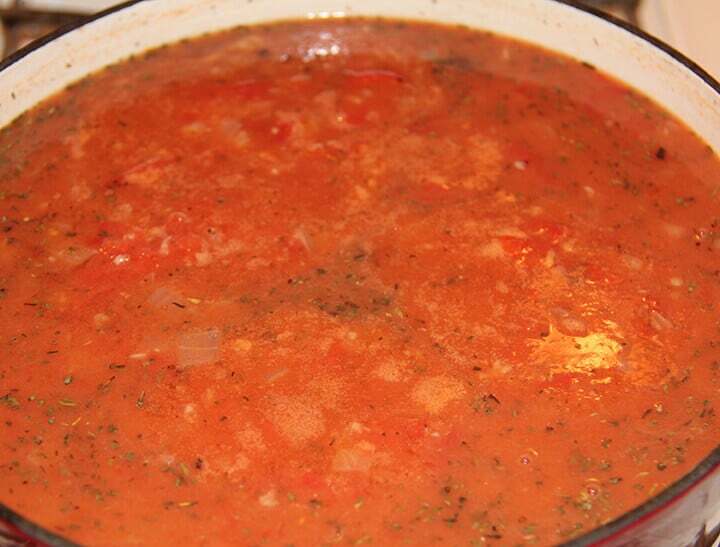 Easy Tomato Soup with canned tomatoes, dried herbs, fresh onion, and just a touch of cream! Heat olive oil and butter in large Dutch oven on medium-high heat. Saute onion for about 5 minutes, then add garlic. Sauté for thirty seconds then add flour and stir until well-blended. Cook onions with flour over medium heat for about 5 minutes, stirring constantly. Slowly pour in tomatoes, tomato paste, and chicken stock. Add sugar, bay leaf, herbs, red pepper flakes, salt and pepper. Bring to a boil then turn down to a simmer. Stir occasionally to keep from sticking. After 45 minutes, stir in the cream and simmer for 15 more minutes. Remove bay leaf. At this point, you can use an immersion blender to partially puree the soup if you like it smoother. Season with additional salt and pepper to taste. Serve warm with freshly grated Parmesan cheese and croutons. Use a non-reactive pan so the acid from the tomatoes doesn't cause a metallic taste. Non-reactive pans would include stainless steel or enameled cast iron which is my favorite. Stay away from aluminum or copper for this recipe. If it's summer and you have access to good fresh tomatoes, you can certainly substitute for the canned. You might need to add a little tomato juice as well. When adding the red pepper flakes and the cream, start with the smallest amounts and then taste, adding more if needed. Update Notes: This post was originally published August 13, 2013, and on December 12, 2018, was updated with one or more of the following: step-by-step photos, video, updated recipe, new tips.